EDITED BY REV. A. A. LAMBING. ing to the operations of the French in this country. France, and of the Country of Louisiana. *These notes are reproduced with the references. 336 Ohio Arch. and Hist. Society Publications. dried, which had been gathered up at the foot of the rapids. was all that made up his mission.6 The 26th, I set out from M.
second in command of the detachment, to set out with Messrs.
me, I went to the portage which M. de Contrecoeur had made. 388 Ohio Arch. and Hist. Society Publications. Ganaouagon17 and of the Cut Straw.18 In the evening Messrs.
having cleared about three-quarters of a league19 of the road. ing the Canadians to discipline, of which they stood in need. abated I resumed the march, and that day made half a league. his detachment and the chiefs, the 25th of July, 1749. 340 Ohio Arch. and Hist. Society Publications. only to treat with them of good things. kuin, this 25th of July, 1749. All the officers signed. France, we Celoron, commander of the detachment sent by M.
of July, 1749. All the officers signed. Joncaire of my arrival, they were on the watch to discover me. 342 Ohio Arch. and Hist. Society Publications. only in our villages, but in all those of the Beautiful River. 344 Ohio Arch. and Hist. Society Publications. the fears which my expedition into this country has caused you. you, if like sensible people you wish to avail yourselves of them. bring to all the villages of the Beautiful River." Nations have forbidden them to remain beyond the mountains. ness, and if they are wise they will profit by my advice." speak to us as a good father. winter, and that we will go next spring. 346 Ohio Arch. and Hist. Society Publications. Two belts of wampum to the Indians of the detachment. told us, and we will pay attention to it." that they would go down next spring to see their father Onontio. 348 Ohio Arch. and Hist. Society Publications. sess you will be always masters of." that by spring the English shall retire." induced them to keep the promise which they had given me. immediately set out. We made about fifteen leagues that day. order to give M. de Joncaire time to reach the village of Attique. 350 Ohio Arch. and Hist. Society Publications. conducted to the River au Vermillion, on the Wabash, in 1745.
kindness, and that they should profit of the advice I gave them. preliminaries of the peace, signed more than fifteen months ago. I passed by a Loup village47 in which there were only three men. people had gone to Chiningue, not hazarding to remain at home. Chavenoun.50 I made the same citation to them as to the others. examine by my countenance if they could discover my plans. the 8th of August, 1749.
of the village, whom we are awaiting, shall have arrived." 354 Ohio Arch. and Hist. Society Publications. on the part of your father Onontio." in the village. On hearing this, which I communicated to Messrs.
braves of the village had arrived earlier during the night. ernor, to which they listened with marked attention. 356 Ohio Arch. and Hist. Society Publications. of August. 1749, A belt. am going to look for to tell them to retire." 358 Ohio Arch. and Hist. Society Publications. down next spring to hear the word of our father Onontio. that we may find some at Niagara when we are passing that way. our father and assist us." convinced he will not refuse him to you." that we will do, without reserve, all that you have asked of us. us, and we shall pay attention to it." land there, having spoken to them at Chiningue. 360 Ohio Arch. and Hist. Society Publications. lowing official statement of it. with Messrs. the officers at our camp, the 15th of August, 1749.
that way to ply their trade on the Beautiful River. official statement, and which we have signed along with Messrs.
the officers at our camp, the 18th of August, 1749. 362 Ohio Arch. and Hist. Society Publications. for me to represent to me that they were afraid to go to St.
false reports, which would lead them to lay ambushes for us. 364 Ohio Arch. and Hist. Society Publications. were disposed to follow him; and, for security, they retain M. defense." This caused me to make the most serious reflections. quarter-of-a-league's distance from the village I was descried. 366 Ohio Arch. and Hist. Society Publications. held firm to this point and brought them round to my views. of our brethren, and we beseech you to forget this great mistake. The sorrow we feel for it gives us hope that you will pardon us." for it, constrain me to pardon you. Be wiser for the future. father Onontio; which I bring to you." 368 Ohio Arch. and Hist. Society Publications. only to procure them that which is most advantageous." notice of the dispositions of the people of Detroit. Answer of the Indians of St. Yotoc, to the speech of M.
only in what is right." ment, against the beginning of October. these people on matters of importance. I drew up an official statement. entrance of the Rock River, the 31st day of August, 1749. The inscription is always the same. scarcity of water in this river, it took thirteen days in ascending it. having come for camping, we passed the night in this place. scarcity of provisions then in my possession to give them supper. in order to ruin you in my estimation. such a way that not a single spark can escape." who call you back to your village. selves of what I do for you." The 18th. About nine A. M., they came to give their answer. pipe with our father next year. mission. We have none other but good answers to give you. addressed us. We see clearly that you have not forgotten us. done so, and we shall continue to do so during the whole winter. 376 Ohio Arch. and Hist. Society Publications. and assuring me that they would return thither next spring. buy provisions and canoes to convey me to Detroit. nations of the south let loose against the French." whose courtesy I am much indebted for the copy. manuscript, with all the errors of orthography and French." Paris, 24th March, 1885. Edmond De. Hennetot. collated with the original by a person worthy of all confidence." 378 Ohio Arch. and Hist. Society Publications. For a notice of Celoron, see Researches, vol. I, p. 13, note. Also Montcalm and Wolfe, Parkman, vol. I, chapter II. died at Nemour, October 26th, 1756.
gratitude by criticizing him. This is but one instance. St. Sulpice, Paris, and was admitted into that Congregation. Onondaga and Cayuga, all eager to receive Christian instruction. chie owing to the successes of the English against the French. Bishops and the Pope. He died at Verjon, July 15th, 1781.
coloring to his account of this zealous missionary. seventeenth century.- Drake's Indians of North America, p.
13; Shea's Charlevoix, vol. II, pp. 8, 9, note. villages to hunt or wage war. Frontenac. -Shea's Charlevoix, vol. III., pp. 175, 176. 8. I have not been able to learn anything of this officer. calm and Wolfe, vol. I., p. 486. See Montcalm and Wolfe, passim. 12. Around the falls and rapids of Niagara. that name. For the meanings of the word, see Marshall, as above. I have adopted Mr. Marshall's translation. 380 Ohio Arch. and Hist. Society Publications. loaded canoes, except near its mouth." 17. For a notice of this village see p. 388. 18. See further on p. 343.
always overstated by the early French voyageurs in America,"
was meant the Allegheny and Ohio. American Cyclopaedia, vol. IV., p. 346. Journal no definite idea of its length can be ascertained. na gi-a, he stays long." Indian Names, etc., Heckewelder, p. 21.
tion from the Gulf of Mexico to within ten miles of Lake Erie. -American Cyclopaedia, vol. V., p. 221." this officer in my reading. vol. II., p. 124, note. ister of Fort Duquesne, pp. 16, 17, note. frequently resorted to in the New World. 27. Another name for Conewango Creek. which the French laid claim. site of what is now Irvineton. have never before met the name. quakink, or men of red clay, the name now used by the tribe. paedia, vol. V., p. 362. 382 Ohio Arch. and Hist. Society Publications. 37. The French word is oncles, uncles. 38. John Frazer. -History of Venango County, p. 42.
river in Father Bonnecamp's map. Creek-see Researches, vol. I., p. 17, note. 41. This rock has long been known as "The Indian God." exactly 115 miles above Pittsburg. and Mahoning sixty.-Researches, vol. 1, pp. 18, 19, note. ning, I have been at all these places times without number. Allegheny. It was on both sides, though principally on the east. any map, of any Indian village at the mouth of the Kiskiminetas." Certainly Father Bonnecamp's map gives neither river nor village. evidence will be brought to prove the position here maintained. Kittanning, the point wi1l, I think, be placed beyond question. lost by the fire. "-Montcalm and Wolfe, vol. I., pp. 426, 427. 384 Ohio Arch. and Hist. Society Publications. the 9th of September, 1756, that Attique has been attacked; Col.
of the same year, of the destruction of Kittanning on the 8th. engagement having taken place at or about that time and place. far as I can find, on this point. into the river on the opposite side. that the date was not given in figures, but was spelled out in full. ancien villages des Chaouanous, le sixieme Aoust, 1749." above the confluence of the Allegheny and Monongahela rivers. country in 1745, by order of the Marquis de Beauharnois. 386 Ohio Arch. and Hist. Society Publications. reader can compare this extract with the Journal, as above. 49. Aliquippa. See Researches, vol. I., p. 21, note 43.
no mention of the Monongahela river. Paris; Chronicle of the Canadian Clergy. text conveys the idea of the Celoron. better to conceal their leaning towards the English. p. 16, notes 19 and 20. (Montcalm and Wolfe, vol. I., p. 46,) also embraces this opinion. there. The writer also refers to certain passages in the Pa.
in the affairs of the Ohio valley. to determine the precise spot from the Journal. tions all the principal rivers he passes. 63. 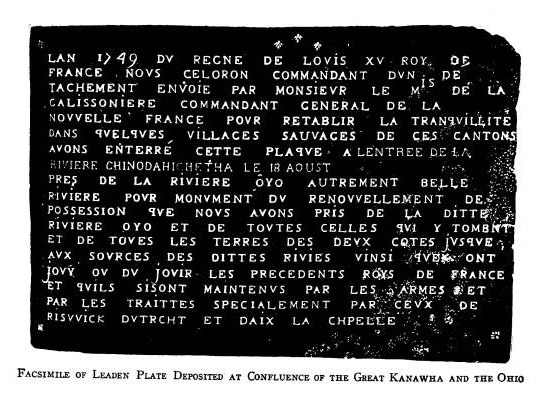 "Fortunately the discovery of the plate in March, 1846,"
says Mr. Marshall, (p. 145,) "leaves no doubt of the inscription. was projecting from the river bank, a few feet below the surface. from the Journal, that on the plate being Chinodahichetha. colony some forty years later. It is 354 miles below Pittsburg. of the young men to the present emergency. are given as in the Journal, are unknown to me. 67. The same must be said of this place. Mississippi, nearly opposite St. Louis. history, and need not be discussed in this place. accustomed to penetrate to the west from Carolina. 7I. See Researches, vol. II., p. 64. 72. Riviere la Blanche, probably the Little Miami. 390 Ohio Arch. and Hist. Society Publications. eating him. - Montcalm and Wolfe, Parkman, vol. I., pp. 84, 85.
pathies of the Indians with the English. 75. This was the last leaden plate buried by the expedition. 76. This is apparently a mistake for the 1st. the present city of Fort Wayne. "It undoubtedly took its name,"
Journal, but they are given as they are found. some Western writers that his name was Morgan is unfounded." and others.- Shea's Charlevoix, vol. VI., pp. 121, 122.
vol. II., p. 55, note. 82. See Researches, vol. II, p. 63.
one of the Six Nations. - Shea's Jogues' New Netherlands, p.
am at a loss to know what animal is meant by the last term. 392 Ohio Arch. and Hist. Society Publications. filled with raccoons." - Col. Smith's Captivity, pp. 81, 82. 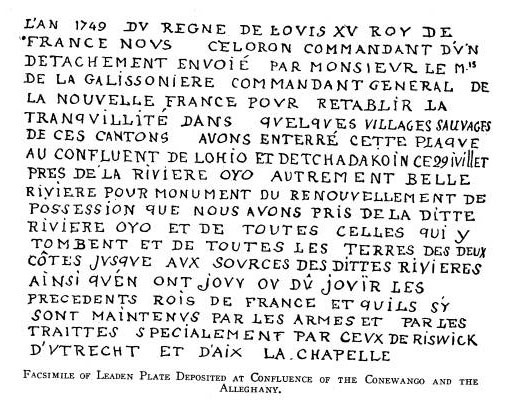 REFERENCES TO REGISTER OF FORT DUQUESNE. Chief of the forts of Duquesne, Presqu' Isle and the Riviere au Bouefs'. speaking; but he afterward succeeded to the command of Fort Duquesne. Fort Duquesne, I have not been able to learn." English at the capture of Fort Niagara.-Mag. Amer. Hist., Vol. 2, p.
130; The Olden Time, Vol. 2, p. 152. Celoron's Expedition. The former took the most prominent part. ADDITIONAL NOTES BY REV. A. A. LAMBING. born at Montreal, on the 29th of December, in the year 1693. Montreal, on the 29th November, 1686, and had a large family. command of the Baron de Longueuil, with Celoron as captain. party of Indians, joined the expedition under Celoron's orders. 394 Ohio Arch. and Hist. Society Publications. the governor acquainted with these transactions. *At the head of Lake Champlain. too proud to humiliate himself in pleading his own cause. land, in the summer of 1756. (See New York Hist., Doc. Vol. and all our historians, have made the same mistake about it. 396 Ohio Arch. and Hist. Society Publications. ada. See Daniel, Histoire des grandes families du Canada. there for the second time when Celoron met him at Niagara.